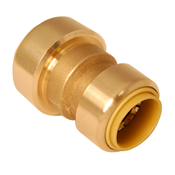 ProBite's�lead free reducing coupling connects Copper, CPVC, and PEX tubing in any combination, for long lasting full flow connections. Easy to install, easy to remove, reusable, long lasting and backed by a 75-year warranty. Eliminates soldering, glues, and compression tools and wrenches. Reducing Tee 1/2" x 1/2" x 3/8" 1/2" Push Angle Valve x 1/2" FIP x 12" Faucet Connector Hose, EPDM Seal - Lead Free Faucet Push Connect Push Reducer 1" CTS x 3/4"
1/2" angle valve x 7/8" plastic connect, 18" Lead Free Toilet Push Connect Supply Hose Push Connect™ Elbow Fitting 1" x 1" PC Elbow Integrated Full Port Push Connect™ Ball Valve 1" x 1"